With more than 200 members and 180 institutional and technical partners, Pierre & Terre is an association based in the southwest of France, which exists since 1997 and to promote the development of ecological alternatives. Our missions are to inform, organize workshops and support individual eco-projects in 3 areas of concern : water, nature and garden (to concerve and learn about water resources, natural habitats and biodiversity, to encourage organic gardening, to share experiences…), ecoconstruction (to promote ecological techniques and materials which guarantee low ecological impact and good air quality in the house…) and responsible consumerism (to promote local and organic food, green products, to reduce and recycle our waste…). 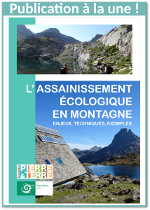 Association Pierre & Terre meets about 10000 people every years, through visits to the “écocentre” and by being involved in more than 50 micro-projects led by individuals, associations, schools, companies, town councils… all in favour of positive alternatives for our planet. The “écocentre” permits us to inform visitors using different exhibit spaces, a library and a small ecological shop as well as the building being an example of ecological construction. The building and the materials used have a low ecological footprint and a low carbon footprint, and all these materials, which are local and natural, are characterised by a high level of recycling capacity. We can find in the building straw bales, hemp fibre, sheep’s wool, local timber (such as plane wood, cedar, oak, chestnut, pine and Douglas fir) cellulose wadding, natural pigment, lime, adobe, terracotta floor tiles… The choice of these « healthy » materials guarantee a good air quality inside the building and also better work conditions for the builders.